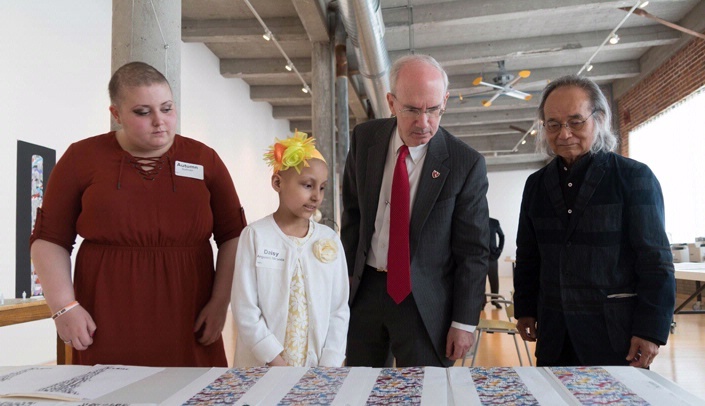 From left, Nebraska Medicine patients Autumn Sullivan and Daisy Anguiano Miranda took part in the announcement with UNMC Chancellor Jeffrey P. Gold, M.D., and Jun Kaneko. 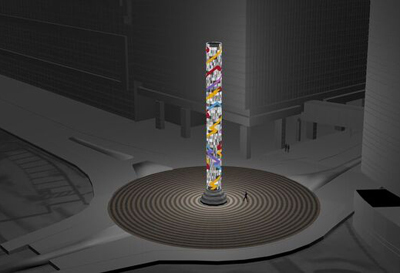 An 82-foot lighted glass tower designed by Omaha artist Jun Kaneko will be constructed in front of the Fred & Pamela Buffett Cancer Center on the campus of UNMC and its clinical partner, Nebraska Medicine. The Search Tower is part of a series of art projects associated with the Fred & Pamela Buffett Cancer Center through the Healing Arts Program and the One Percent for Art Program, in which 1 percent of the cost of building is set aside for art. The Chihuly Sanctuary by Dale Chihuly, one of the world's foremost artists working in glass. Leslie's Healing Garden, an outdoor, year-round garden made possible with a gift by Marshall and Mona Faith of Omaha. The Faiths' daughter, Leslie, died of cancer more than 60 years ago. A metal curtain wall on the outside of the building by Rob Ley of Los Angeles. Light and color will reflect off the metal curves. A large-scale painting for the cancer center lobby by Suzy Taekyung Kim of Brooklyn, N.Y. The painting will feature eight customized wood panels. Gail Walling Yanney, M.D., a committee member of the Healing Arts Program at the Buffett Cancer Center, said it's anticipated that hundreds more original works of art will eventually round out the program -- all designed to provide patients, staff and visitors with inspiration, comfort and calm, while also creating an atmosphere that feels distinctly different from the traditional hospital setting. The tower, which is made possible with a gift from an anonymous donor, is expected to be completed by next spring when the cancer center is expected to open. The tower itself is actually 75-feet high, but its 7-foot base brings it to 82-feet. The project was announced Wednesday at a news conference hosted in a gallery space provided by KANEKO in downtown Omaha. Read the World-Herald's coverage of the project here. Kaneko is calling the tower "Search." He began working on it in January. It will be located at the corner of 45th Street and Dewey Avenue. The corner will be reconfigured to include a roundabout. The glass tower will be located in the middle of the roundabout. It will be placed on a pedestal made of black and white granite and surrounded by black and grey pavers in radiating concentric rings in the 36-foot wide roundabout around the tower and 16-foot wide truck skirt lane. "It's a beautiful site. It fits perfectly," said Kaneko, who has done art projects around the world. "The cancer center is like a huge creative center. To be next to that kind of building, it's an honor. I really appreciate this opportunity. It's going to be in my hometown. I can't wait to see the piece up." UNMC and Nebraska Medicine are thrilled to have Kaneko doing the project, said UNMC Chancellor Jeffrey P. Gold, M.D. "We are really fortunate to have an iconic representative of the Omaha community doing a major art feature for the medical center," said Dr. Gold, who also chairs the Nebraska Medicine advisory board. "The glass tower will be widely appreciated by our students, faculty and staff as well as the whole community. It will be a beacon of light that will spread far and wide from our campus." Kenneth Cowan, M.D., Ph.D., director of the Fred & Pamela Buffett Cancer Center, said, "It will be a cornerstone of the cancer center - a guiding light for patients. It ties in perfectly into the importance of art and healing." He noted that the tower will provide "a spectacular doorstep to the medical center" and will be visible for several blocks to the north on Saddle Creek Road as well as from the south and west. Hand-cut and ground, hand blown stained glass with color and opaque flash laminated onto 120 carrier safety glass panels. Each panel weighs 341 lbs. Two layers of 5/16-inch-thick, fully tempered, heat-soaked, low-iron glass with opaque PVB film interlayer. Roundabout will feature locally sourced black and grey pavers in radiating concentric rings. Jun Kaneko has worked with a variety of glass techniques creating artwork for more than 40 years. This is the third project he has created using this technique. Glass is chemically the same as a glaze except light passes though it adding another dimension to the piece. Kaneko wants to create a positive piece that has a universal impact on all of the people who work at the medical center as care givers, researchers, doctors and nurses and the patients and families who come to the Fred & Pamela Buffett Cancer Center for treatment. The tower is being fabricated by master glass artisans in Germany. The tower will be lit at night by interior LED diodes. The Hope Tower - on the east end of campus (near 40th Street and Dewey Avenue) - is 120 feet high. It was created by James Carpenter, an internationally recognized artist from New York. Omaha philanthropists Ruth and Bill Scott made the lead donation on the Hope Tower.